Manila, March 19, 2014— This April 2014 marks the second anniversary of the hit zombie run Outbreak Manila. And this time, the organizers of the Philippine’s longest-running zombie event promise to take excitement to a whole new level with a live-action, survival experience called Outbreak Missions. Outbreak Missions had its first debut last October 18 and 19, followed by an encore on November 16, 2013. Participants called it the best Outbreak Manila yet, with over twelve thousand people completing a course of challenges, special characters, and clues—all while being chased by a horde of undead. And now—thrill finds a new date and venue at the biggest Outbreak Missions yet! 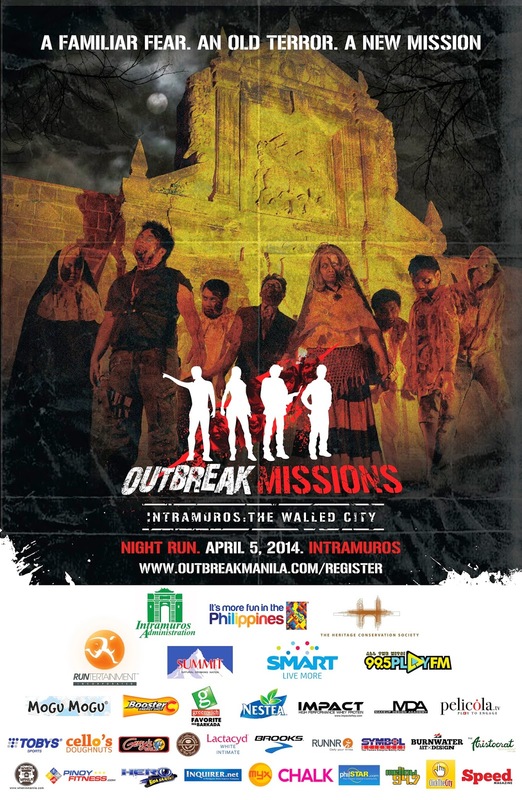 This April 5, 2014, the adrenaline-fuelled zombie adventure takes you to the Historic Walled City of Intramuros. What can you expect? Surprising twists, thrilling turns, and flag-hungry zombies. The event promises to be the most-exciting Outbreak Missions yet. See if you have what it takes to survive a zombie apocalypse. Registration is ongoing at select Toby’s, RUNNER, and BROOKS outlets. Outbreak Missions is brought to us by Intramuros Administration, Department of Tourism, Heritage Conservation Society, Runtertainment, Summit Natural Drinking Water, Smart, 99.5 PLAY FM, Mogu Mogu, Booster C, Greenwich, Nestea, Impact High Performance Whey Protein, Makeup Design Academy, pelicola.tv, Toby’s Sports, Cello’s Doughnuts, Gerry’s Grill, The Coffee Bean & Tea Leaf, Lactacyd White Intimate, BROOKS, RUNNR, Symbol Sciences, Burnwater ArtxDesign, The Aristocrat, WhenInManila.com, Pinoyfitness.com, Hero, Inquirer.net, MYX, Chalk Magazine, Philstar.com, Mellow 94.7, ClickTheCity, and Speed Magazine. For more information, visit outbreakmanila.com/missions or find Outbreak Manila on Facebook.